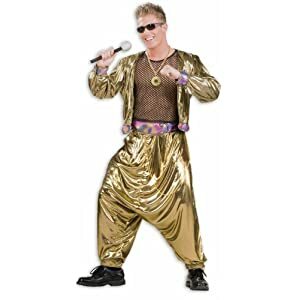 Shimmering gold jacket over a brown mesh shirt and matching baggy pants. Grab a mic to be the hit of the night. One size fits most teens and adults. 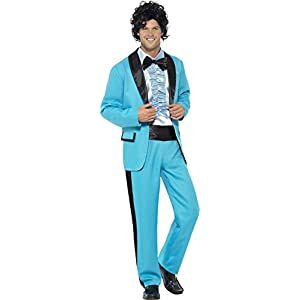 Men’s 80’s Rock Star, Including: Jacket, pants and Vest, Ideal for outdoor or indoor events, Perfect for Carnival and Theme parties. Size L: Chest: 42-44 inch, Waist: 36-38 inch, Inside Leg: 33 inch, lightweight material for comfort avoids overheating. Easy to put on and take off, Visits to the toilet made easy thanks to elastic waistband. 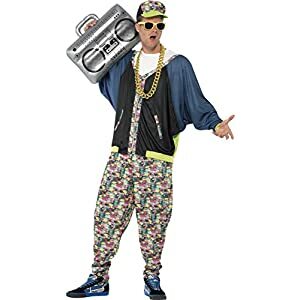 Men’s 80’s Hip Hop, Including: Jacket, pants and Hat, Ideal for outdoor or indoor events, Perfect for Carnival and Theme parties. One Size, Sizing allows for wear over clothing. Easy to put on and take off, Visits to the toilet made easy thanks to elastic waistband and zipper. Pink leopard print bow headband and black layered dress. Hot pink mesh half-shirt with two neon orange and green belts. One size fits most teens and adults teens and adults. Gold cone cup leotard with removable garters, black leggings, and belt included. Wig not included. 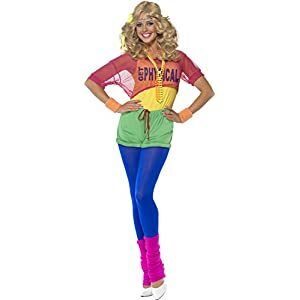 Women’s Let’s Get Physical Girl, Including: Leotard, Crop Top, Shorts and Headband, Ideal for outdoor or indoor events, Perfect for Carnival and Theme parties. Size 6-8: Bust: 35-36inch, Waist: 27-28 inch, Hip: 37-38 inch, lightweight material for comfort avoids overheating. Easy to wear.